At Lionfish Modern Coastal Cuisine, we’re known for our creative California-meets-Coastal cuisine and beautiful atmosphere. But what makes both the food and the setting even better? The perfect cocktail, naturally. Lionfish boasts an innovative cocktail menu, featuring mixology-forward beverages that are bound to delight. From classic to sweet-with-a-touch-of-heat to unusual yet delicious concoctions, you’re bound to find a new favorite drink. Here, we’ll take you on a tour of our specialty cocktail menu so that you can get to know our eclectic offerings. Be warned, though: as you read these descriptions, you may begin to experience massive cocktail cravings! Don’t forget about Happy Hour! 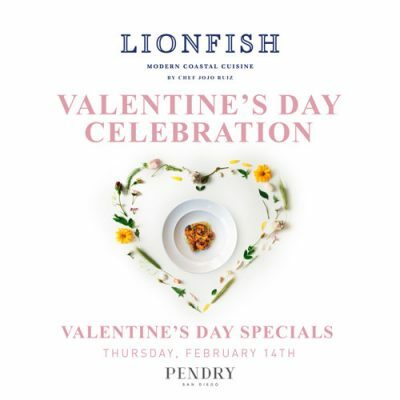 At Lionfish Modern Coastal Cuisine, we offer select cocktails for just $8 each during Happy Hour, which takes place daily from 5-7pm. The cocktails offered during happy hour are noted below. Be sure to check out our post on Happy Hour food and drink pairings! Bulleit Bourbon, Amaro Nonino, maraschino, cinnamon, and Angostura bitters. Blackberry Bliss: Is there anything better than the flavor of blackberry and lemon together? Yes: a cocktail with both of them, plus Russell’s Reserve 10 Year Bourbon, Plantation 5 Year Rum, and some spicy ginger. Blueberry Hill: You’ll be feeling the blues (in a good way) with this easy drinking cocktail, made with Tanqueray 10, St-Germain, Creme de Violette, lime, mint, and Blueberry Redbull. 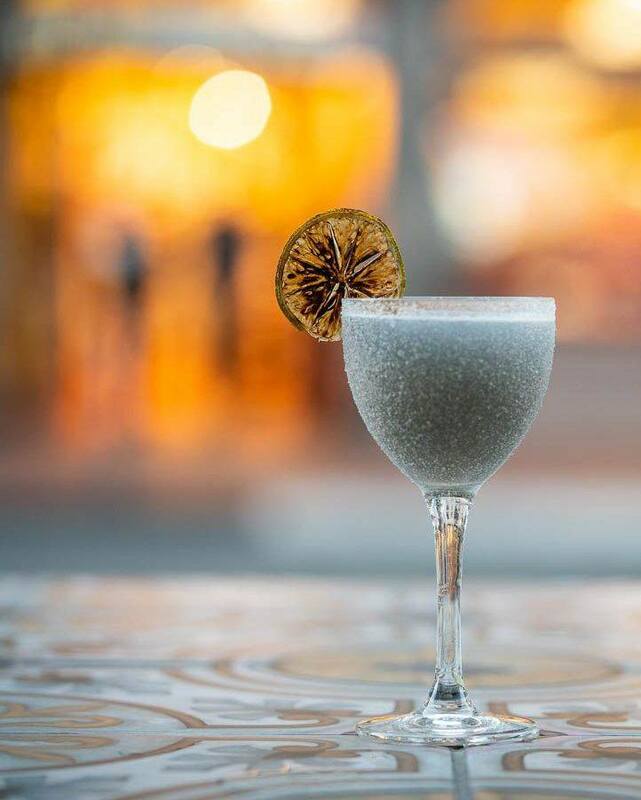 Coronado Island: A famed San Diego area beach serves as the inspiration for this breezy cocktail, which features Belvedere Vodka, Bombay Sapphire Gin, Bacardi Superior Rum, Fernet, citrus, seltzer, and an intriguing subtle saltiness thanks to fleur de sel. Note: The Coronado Island cocktail is on special during Happy Hour! Expat: You’ll feel incredibly worldly while sipping this classy and classic-tasting drink, which is made with Maker’s Mark, lime, mint, and bitters. G-Mail: Your email inbox will feel very far away as you disappear into this cocktail experience. The G-Mail is made with an intoxicating (and addictive) combination of Hennessy VS, Rothman and Winter Orchard Apricot, and honey, then finished with lime. Note: The G-Mail cocktail is on special during Happy Hour! 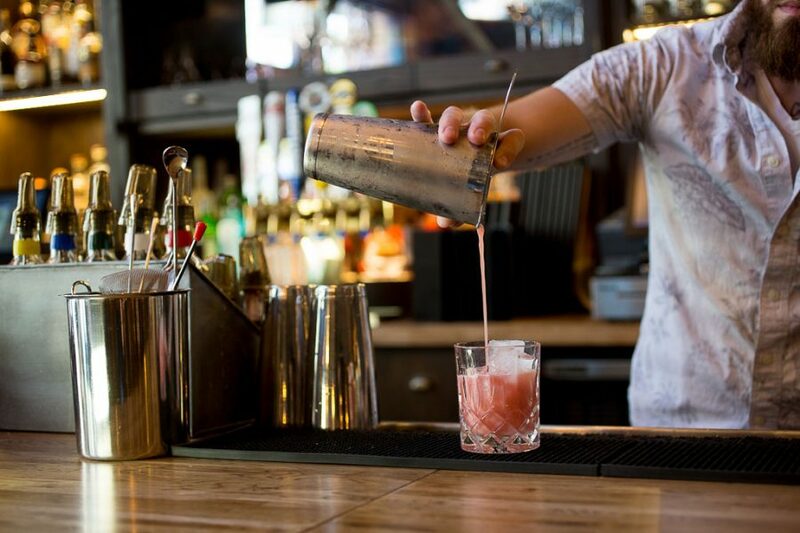 Guardian Angel: You may feel like your mixologist is very much your guardian angel when you take a sip of this tempting and tantalizing beverage, which is made with Angels Envy Bourbon, Cocchi Rosa, ginger, pomegranate, and lemon. Hot in Jalisco: This drink packs a little heat, but we think you’ll find it refreshing! It’s made with Habanero Infused Don Julio Blanco, grenadine, grapefruit, and lime. Raspberry Beret: Prince famously sang, “She wore a raspberry beret…if it was warm she wouldn’t wear much more”. You might feel like shedding some layers after enjoying this attitude-adjusting cocktail, which is made with Absolut Elyx Vodka, Aperol, Cocchi Rosa Americano, raspberry, lemon, and Sancerre (a crisp and refreshing type of white wine). 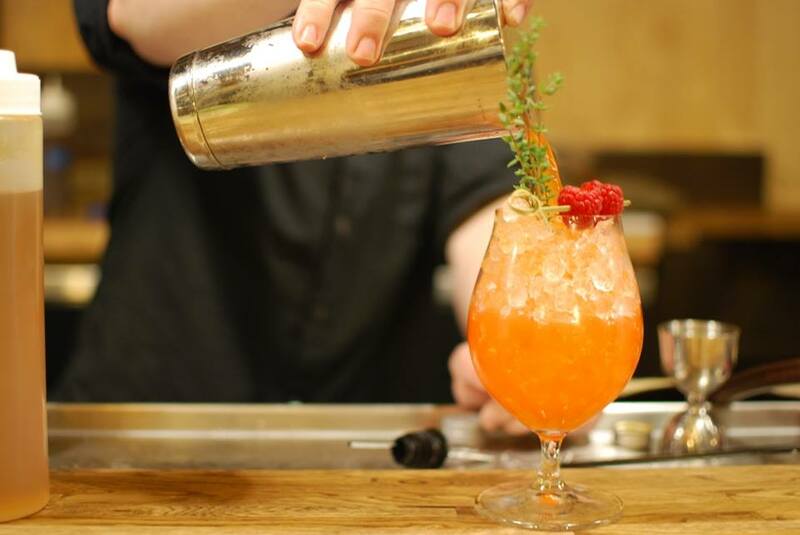 Rice-Paper-Scissors: This intriguing cocktail has a distinct Asian flair, and pairs beautifully with the sashimi, Nigiri, and specialty rolls on our menu. 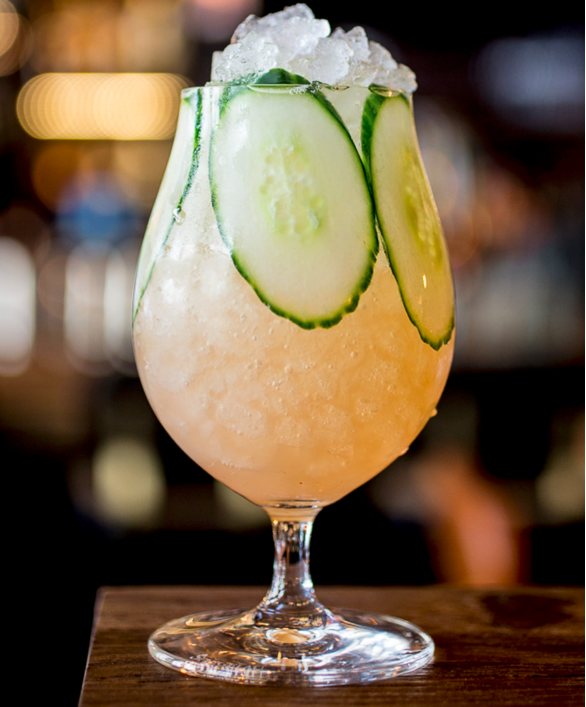 It’s made with Plymouth Gin, Junmai Ginjo Saké Pimm’s Mix, lemon, cucumber, and Ichimi Togarashi Syrup. You’ve never tasted anything quite like it, that’s for sure. Note: The Rice-Paper-Scissors cocktail is on special during Happy Hour! Tequila Mockingbird: You may or may not feel like dancing on the table after a few of these. This drink features a melange of sweet paired with some heat and an intriguing smokiness. It’s made with Casamigos Blanco, Ancho Reyes Chile Liqueur, pink guava, coconut, lime, peach bitters, and spicy smoked sea salt. Wake Up Call: Love coffee? This sweet sipper will simultaneously rev you up and chill you out. It’s made with chai and vanilla bean infused Grey Goose Vodka, espresso, St. George NOLA Coffee Liqueur, coconut, and black walnut bitters. Champagne Supernova: You’ll want to drown in this champagne supernova! This cocktail is unique in that it’s meant to be shared: each order serves 4-6 people. It’s the perfect way to get the party started. This buoyant bubbly drink is made with 50 Bleu Vodka, Ciroc Red Berry, Aperol, ginger, lime, mint, and Chandon Brut. It’s light, bright, festive, and utterly refreshing. 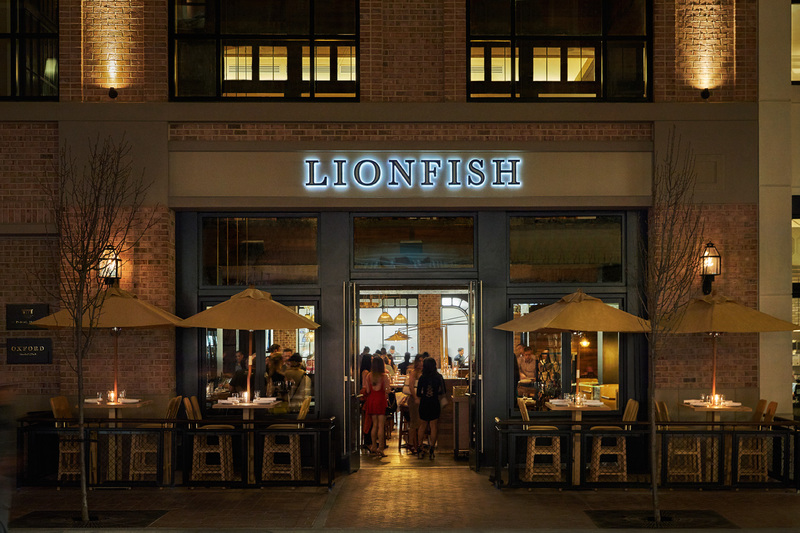 Conclusion: While Lionfish Modern Coastal Cuisine is perhaps best known for offering delicious cuisine in the Gaslamp Quarter, our cocktails truly can’t be missed. Come on by and try a cocktail (or two, or three) so that you can experience the mixology magic for yourself! Have you tried the specialty cocktails at Lionfish?